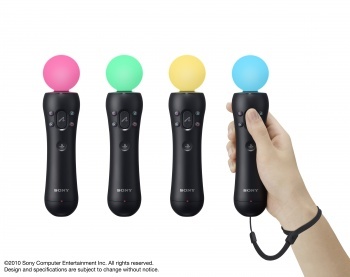 It's rumored that Sony's PlayStation Move will be making arms flail wildly just as kids are forced back into school. Sony's plans for the release of its lollipop-like motion controller that you can lick but probably shouldn't, the PlayStation Move, were set for a general fall 2010. Thanks to Jason Bradbury of the UK's Gadget Show (on Five), rumors are hovering that September will be the month of Move's release. Bradbury tweeted: ".. another thing I was meaning to say. Sept for Playstation Move!!! I'm sure of it. Can't say why. Just.. September 2010." The Gadget Show is a technology news show, so maybe Bradbury caught a whiff of some PlayStation Move information somehow. Sony sent a statement to VG247 that said: "SCEE will confirm the launch date for Move in due course, and any dates mentioned at present are just rumor and speculation." A rumor also leaked out earlier this week that Microsoft's Natal would be launching in October, so maybe Sony wanted to make sure they hit a month earlier. It looks like E3 2010, which runs from June 15-17, will hold many an announcement about release dates, including Natal's, Move's, possibly the Nintendo 3DS's, and lord knows what else.